The building of naval station on Tristan in 1942 brought modern facilities, and the establishment of the fishing factory in 1949 improved the island's economy. As World War II approached, German U-boats and the battle ship Graf Spee were sighted off Tristan and in 1942 a top secret naval station code-named Job 9 (later HMS Atlantic Isle) was established on Tristan. Its role was to monitor U Boats (who in those days needed to surface to maintain radio contact) and maintain a meteorological station. A local unit of sixteen men were trained as the Tristan Defence Volunteers, but Tristan only had a communications role in the world conflict. The impact of the ‘Station’ was nevertheless dramatic. Under the command of Surgeon Lieutenant Commander Woolley, new buildings were constructed including accommodation, offices, and for the first time a purpose built school, hospital and store. Islanders were employed for cash wages for the first time and were able to spend them in the store, still known on Tristan by the name 'Canteen' as it was during the war years. Perhaps more significant was the role occupied by Dr Woolley, who revived the Island Council, and, through his role in charge of HMS Atlantic Isle, effectively became the first of a line of British Administrators. Unlike the priests who also exercised a leadership role, Administrators were official representatives of the British Government in what was to change from The British Empire to British Overseas Territories over the next 60 years. Islanders’ homes were vastly improved by the installation of running water and a sewage system linked to new ‘privies’ built originally outside homes. After the war, part of the wartime infrastructure was maintained as the UK government provided expatriate personnel for key services including : Administrator ; Radio Operator (always known as the ‘Sparker’ ); Doctor; and Teacher (s). Rev Lawrence, who served as priest during the war, successfully lobbied for the development of a commercial fishery exploiting the abundant crawfish or Tristan Rock Lobster, which he realised would be in demand in high-class restaurants across the world. Following a successful fishing survey expedition aboard the MV Pequena in 1948, the Tristan Development Corporation was formed in 1949 and a canning factory built on Big Beach later that year. So paid employment, begun during the 1942-46 Naval Station period, was expanded as men were employed to go out fishing, and both men and women worked in the factory. 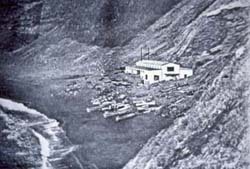 Additionally there were jobs in an expanded range of Government services and in domestic service in expatriate homes in a tradition which extends to this day for those few ‘outsiders’ who are privileged to work on Tristan da Cunha. The old canning factory set overlooking Big Beach. Here the open crawfishing dinghies could be launched from the black sand beach and winched ashore with their catches at the end of the day. Tristan was enjoying an economic boom, boosted by real earnings from crawfish royalties and by the better communication provided by regular fishing and supply boats. 1955/6 saw a scientific expedition to Gough Island (to be featured in the September 2005 Newsletter) followed by an agreement with the South African Government for them to maintain a permanent weather station on the island. A condition of the Gough lease was an annual visit to Tristan by a South African ship, first SAS Transvaal, and from the 1980s RSA Agulhas – still a crucial lifeline for the isolated Tristan community. HRH Prince Philip became the second Duke of Edinburgh to visit Tristan in 1957, and he laid the foundation stone to what became known as The Prince Philip Hall (see Hall Page). 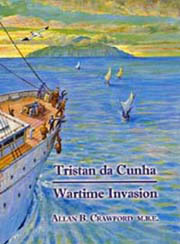 Tristan was probably regarded as a model British Colonial outpost until it was blasted into world attention in 1961. 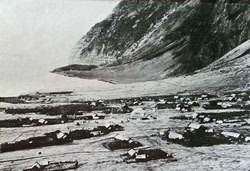 Settlement view c.1957 looking towards Big Point (Factory hidden from view by a spur).